Don’t let the name scare you. 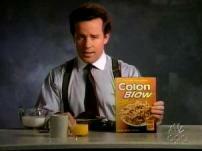 Colon Blow was the name of a cereal in a not-very-funny SNL commercial in the early ’90’s. But, it’s what my friend Heather and I called this, the original PILE in our lives. We made it all the time in our first apartment, ever, which we shared in Austin. About the apartment: We lived next door to 2 guys in a speed metal band who in retrospect, seem really pretty nice. One was called Keith, and the other was called Roland, though we privately referred to Roland as Trackmark. I don’t think Roland had a girlfriend but Keith was dating a stripper. Rhea did laundry once a week and she hung her six pairs of tiny stripping pants out to dry on the porch we all shared. Blue fringy, white shiny, green sparkly: she really had quite the wardrobe. I don’t think she wore shirts. Our lives were, uh, less exciting than theirs. But still pretty exciting! Our apartment had light-blue wall-to-wall and Heather and I each paid $257.5o. Whatever cooking we did was stuff that Heather made up or read about in Moosewood, I think. We ate a lot of vegetable casserole with cheese and breadcrumbs, and tabouli, and I have to say, it was all pretty delicious. To me this still tastes like 22 and swimming every day and Trackmark and our first jobs, to which we wore lots of rayon dresses and sandals. Without nylons, of course. Needless to say, it’s delicious. Stir together soy sauce, vinegar, and mustard until it tastes balanced. (If you don’t have sweet and hot mustard, improvise with seedless Dijon plus cayenne or Sriracha, and a pinch of sugar or honey or maple syrup.) Then, see if there is enough marinade to cover the tofu, and when there isn’t, add more of each thing until it is approximately right, again. Slice firm tofu into rectangles, and marinate in the sauce for an hour or so. Start to cook rice and get ready to steam some broccoli. Heat oil (peanut, corn, safflower, canola) over medium high heat in a wok or other pan. Add marinated tofu when the oil is hot enough to sizzle aggressively, but not outright spit. Fry it until it turns into chicken. By that point the sweetness will be caramelizing on it, and it will be crumbling a bit because you need to turn it over several times. I often find myself turning the heat up to high, and then turning it back down again. There are usually a few chewy burned bits, and those taste good, too. Make a pile of rice, then add steamed broccoli and tofu. Rayon dresses and sandals. Yes. I remember. Love the title so much I almost don’t want to read the post itself.